Asparagus is packed with antioxidants, and ranks among the top vegetables for its ability to neutralize cell-damaging free radicals. Asparagus has between 5 and 12 percent of your daily need of vitamin-C, B-6, zinc, iron, and magnesium. Those nutrients are a great combination, as vitamin-C needs zinc for absorption, and magnesium hitches a ride with vitamin B-6 for absorption as well. Asparagus has been studied and noted to combat age-related ocular diseases, arthritis, asthma, and autoimmune diseases. It is also an effective diuretic for water retention related illness, like PMS, arthritis, and rheumatism. We have noted some of the many health benefits of this spire like vegetable, so you can understand the importance of cooking it right, so as to enjoy them. 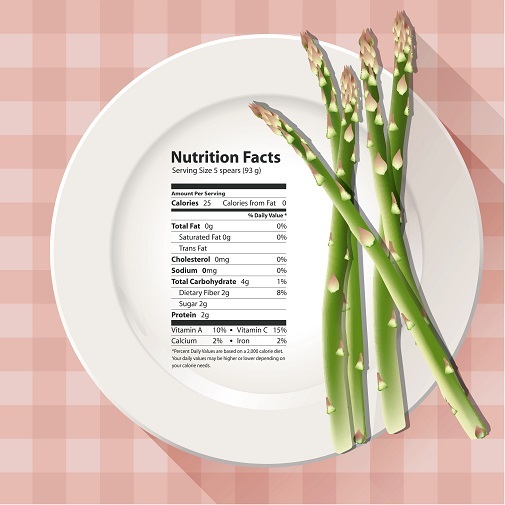 These quick-cooking, water less methods will preserve the fabulous nutritional content and antioxidant power of asparagus, either roast, grill, or stir-fry. Our featured recipe – Asparagus with Garlic and Smoked Bacon – is prepared as a stir-fry. We also suggest this recipe as a prepared side dish to accompany your turkey dinner left overs from last week (Thursday, November. 26, 215). Cut bacon into 1-inch slices, place into a large pan over medium heat. When bacon is 1/2 cooked add garlic and stir until you smell the garlic, about 1 minute. Next add the prepared asparagus and continue to stir until bacon is cooked through, about 2 to 3 minutes. Plate and serve with your favorite main dish. This entry was posted in Side Dish and tagged Abdominal obesity, Barbecue chicken, Chicken (food), Chinese cuisine, Rice, Soy sauce, Stir frying, Strained yogurt, Vegetarian cuisine, Wok. Bookmark the permalink. Great recipe for asparagus. Lots of flavorful ingredients.